Found Air France round trip SFO-CDG in J 777 lie flat non-stop under $3300, dates: 12/22-1/3. Is this a good price for lie flat non-stop trip? It's an okay deal, but there have been deals for around $2500 floating around, especially on expedia with the packages. don´t think it is a good price. there have been several deals for less. As others note, not great. But it does give you Christmas and new year in Paris. This ticket would earn 22332 RDMs 16749 MQMs 4466 MQDs 1.35 MQD Ratio. I will have to wait for a better deal on SFO/LAx-Paris then. Thanks all for the feedbacks. seems high for xmas which is actually low season for C as business class is empty (no corp travelers). Also my understanding is that AF is not lie-flat 180 horizontal on all TATL flights but maybe that changed. Google Flight shows lie flat for 777 flights with AF. Will keep searching for a good deal until end of year for our Paris vacation. For ~$2,600 you can fly VS non-stop direct from SFO to LHR. From LHR you can either take the train or fly in to CDG. This would cost extra but not by much. The self-appointed experts will always tell you just about any deal you think you found is garbage, much worse than some other vaguely described deal they claim to have seen "floating around" at some point. I actually spent the better part of the last two months bird dogging a good Oneworld west coast to Paris fare and can tell you with a fairly high degree of certainty that $3300 isn't a bad price for a nonstop lie-flat route (meaning no FI, for example) to your intended destination. There are plenty of good east coast US to Europe fares, just like there are plenty of west coast to Asia deals. But most fares from west coast cities (I typically check YVR, SEA, PDX, SFO and LAX) to PAR have tended to price beginning in the low $4k range. Getting anything below $3.5k direct into PAR is fairly rare. I finally jumped a week or so ago on a BA J fare from SEA at $3100 (then used AMEX points to minimize cash out of pocket). It wasn't great, but it does get me into LHR directly on a lie flat and includes the hop across the Channel in J. I also saw some west coast to LON fares during my vigil, but if your goal is to fly all J, that extra segment will run you over $500 at xmas time. Eurostar hasn't even published its holiday rates. It's kind of like trying to time the stock market: if you keep waiting for that really great deal some guy on the Internet claims is just around the corner or out there if you just look a little harder, you may end up paying a whole lot more in the end. Yes, those unicorn deals do popup from time to time--I've been fortunate to get on a few over the years--but you have to be a little lucky with your timing and have a lot of flexibility. Below is a snip of some BA J fares. 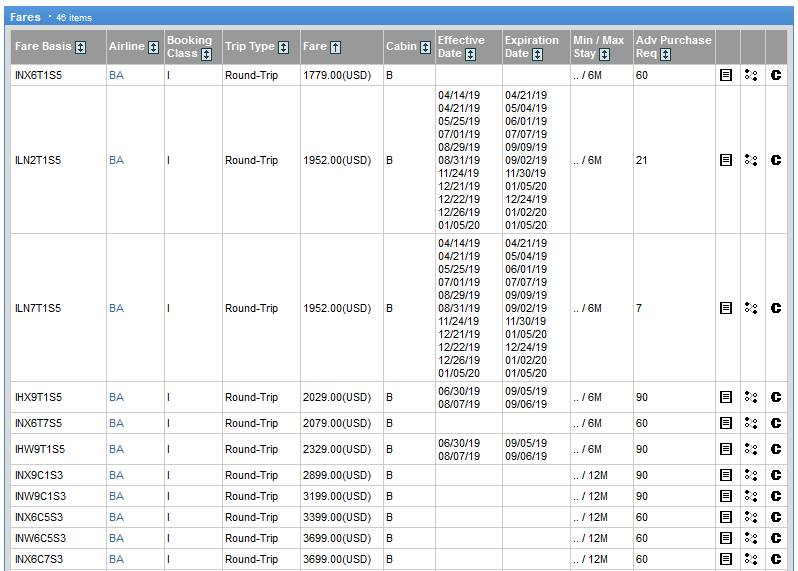 I'm pretty sure my trip is one of the 90 day advance fares, but it isn't readily available. Whatever you decide to do, OP, good luck and happy travels. FrenchCaliFlyer and Pocatello like this. No they don't. It's your call if you wish to dismiss advice of people with experience as to what is a deal vs what is a normal or even high fare. However, no one is by any means always telling posters that their deals are garbage. BTW it's not just one, but multiple people that have pointed out this isn't a great deal. Posting this info will help newer member learn, thus preventing overpaying. As a DL/AF/KL frequent flyer, I agree with them. Is it awful? No. However, neither is it a great deal. Does it mean it shouldn't have been posted? No. However the advice lets users know that its likely there can be better fares at some point. I agree with you. As a newer member, I really need feedback to avoid overpaying. So far, the advice from everyone has been HELPFUL for my situation. I was just looking for a good deal to Paris from LAX/SFO with lie flat seat until the end of year. This trip is nice to have but not required. Flying to London is a possible option especially with the good prices shown in the table. I have a lot of flexibility and schedule. Just make sure I understand correctly, will these fares are these available soon for booking? I was using hyperbole to make a point. Most seem to agree that this deal is neither horrible nor great, as do I (and I said so). But I also suspect too many decent premium fare deals never get posted because the mavens will poo poo them in comparison to the one fantastic deal that may crop up from time to time. Posting specifics or a link is also helpful to newbies (and others), though I understand the impulse not to broadcast a great deal out of fear it will go away faster. My main point for the benefit of the OP and others remains that if you are looking for a particular routing at a particular time on a particular carrier or alliance and don't have a lot of flexibility, you may end up shooting yourself in the foot if you wait around too long for that unicorn fare to drop into your lap.